Download "EXECUTIVE EDUCATION (ACCREDITED) PROGRAMMES GSB APPLICATION INFORMATION DOCUMENT"
1 EXECUTIVE EDUCATION (ACCREDITED) PROGRAMMES GSB APPLICATION INFORMATION DOCUMENT Please note: The following is mandary additional information be completed by all applicants. 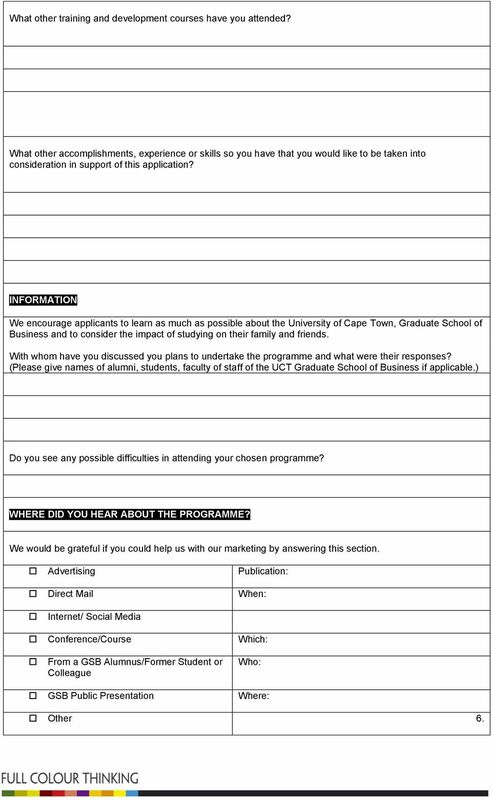 COMPLETING THE GSB APPLICATION INFORMATION DOCUMENT: Please use a black pen or have your application typed ensure legibility. Please keep a copy for your records. 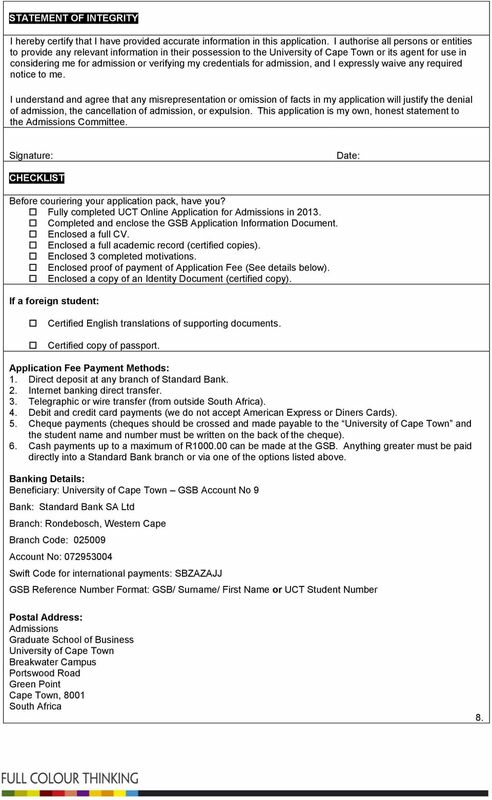 A hard copy of the Application Information Document (see page 8 for additional documentation be submitted) must be couriered or hand delivered : Postal Address: GSB Admissions Graduate School of Business University of Cape Town Breakwater Campus Portswood Road Green Point 8001 Cape Town South Africa Telephone: / Fax: Website: 1. 2 EXE EXECUTIVE EDUCATION (ACCREDITED) PROGRAMMES GSB APPLICATION INFORMATION DOCUMENT Indicate the programme and year for which you are applying: Company Commencing in Year AIM in Management Practice Postgraduate Diploma in Management Practice Postgraduate Diploma in Management Practice in Wine Business Management PERSONAL DATA Surname: Given Names: Name by which you are normally known: Address which all correspondence should be sent: Telephone No (Home): Fax Number (Home): Mobile Number: Telephone No (Work): Fax Number (Work): Address: FINANCIAL CONSIDERATIONS Have you discussed your attendance on the programme with your organisation? Have you discussed with your employer the time and financial requirements for programme? Yes Yes No No Please give details of how you propose pay for the programme and support yourself for the duration of the course: Full sponsorship by organisation Partial salary sponsorship by organisation Applying organisation for sponsorship Other (Please specify): Full tuition sponsorship by organisation Partial tuition sponsorship by organisation Applying organisation for tuition Own funds Bank loan Are you obliged return the organisation and if so, on what basis? 2. 3 EMPLOYMENT PROFILE Have you attached your full CV? Yes No Present employer/organisation: Postal address of employer: Your current position: Your current annual salary package: If you are employed in the private secr, is your organisation a subsidiary? Yes No If yes, please name the parent company: JOB FUNCTION Finance Control Consulting Corporate Planning R&D Legal General Management Marketing Personnel Management Production Management Systems Analysis Teaching Staff Management Other (please specify): Annual budget under your control? Please briefly describe what you do and what your principal responsibilities are: Who you report ; and, do you sit on any board/s, management committee or equivalent? COMPANY SECTOR Advertising Engineering Chemical Textiles Aeronautics Services Engineering Tobacco Agriculture Entrepreneur Paper Transportation Aumobiles Finance Petroleum Wholesale Trade Commercial Hospitality Pharmaceuticals Public Administration Banking Human Printing and (please specify) Communication Resources Publishing Other (please specify) Construction ICTS Real Estate Consulting Investment Research Education Banking Institutions Electronic Mining Retail Trade Equipment Manufacturing Social and Health Energy Services 3. 4 INTERNATIONAL EXPOSURE Please list all international exposure and activities: Activity No of Years Country/Region SUMMARY OF WORK EXPERIENCE Area Type of Experience No of Years Accounting Finance Marketing/Sales Production Computers Research Personnel i.e. 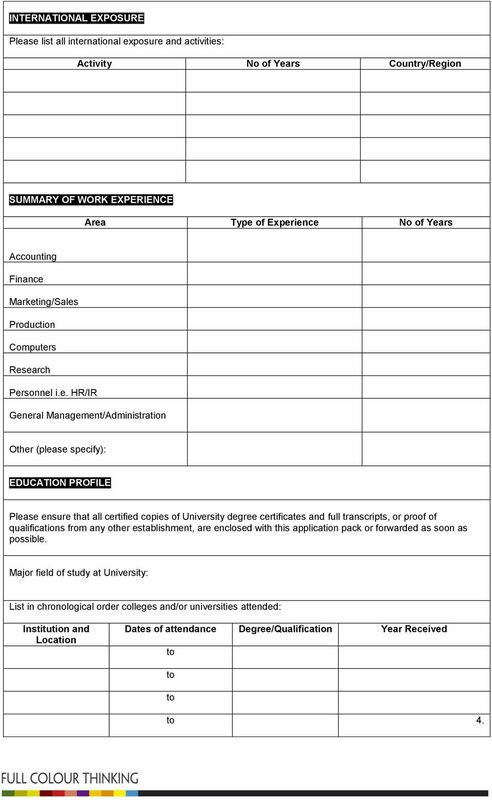 HR/IR General Management/Administration Other (please specify): EDUCATION PROFILE Please ensure that all certified copies of University degree certificates and full transcripts, or proof of qualifications from any other establishment, are enclosed with this application pack or forwarded as soon as possible. Major field of study at University: List in chronological order colleges and/or universities attended: Institution and Location Dates of attendance Degree/Qualification Year Received 4. 5 How would you rate your competence in the following mathematics and computer skills areas? A B C D Algebra A - No experience Statistics B Some previous experience but out of date PC Skills (ie word processing, spread sheets) C Need some refreshing in order be proficient Internet D Am proficient and do not need refreshing LANGUAGES First Language: Second Language: Other Languages: Fluency in English: Fluent Good Average EXTRACURRICULAR ACTIVITIES Please list below, in order of importance you, all significant extracurricular activities in which you have been involved and made a significant contribution i.e. (educational, community, professional, sport, politics, associations, etc.). Attach additional sheets if necessary. 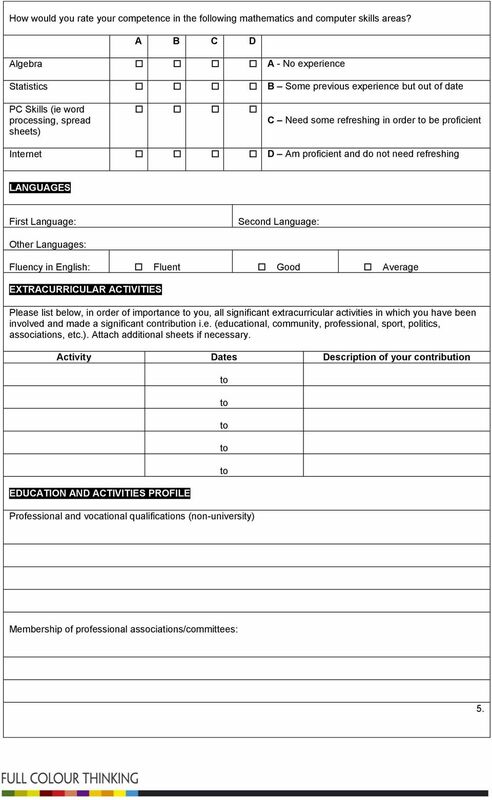 Activity Dates Description of your contribution EDUCATION AND ACTIVITIES PROFILE Professional and vocational qualifications (non-university) Membership of professional associations/committees: 5. 6 What other training and development courses have you attended? What other accomplishments, experience or skills so you have that you would like be taken in consideration in support of this application? INFORMATION We encourage applicants learn as much as possible about the University of Cape Town, Graduate School of Business and consider the impact of studying on their family and friends. With whom have you discussed you plans undertake the programme and what were their responses? (Please give names of alumni, students, faculty of staff of the UCT Graduate School of Business if applicable.) Do you see any possible difficulties in attending your chosen programme? WHERE DID YOU HEAR ABOUT THE PROGRAMME? We would be grateful if you could help us with our marketing by answering this section. Advertising Publication: Direct Mail When: Internet/ Social Media Conference/Course Which: From a GSB Alumnus/Former Student or Colleague Who: GSB Public Presentation Where: Other 6. 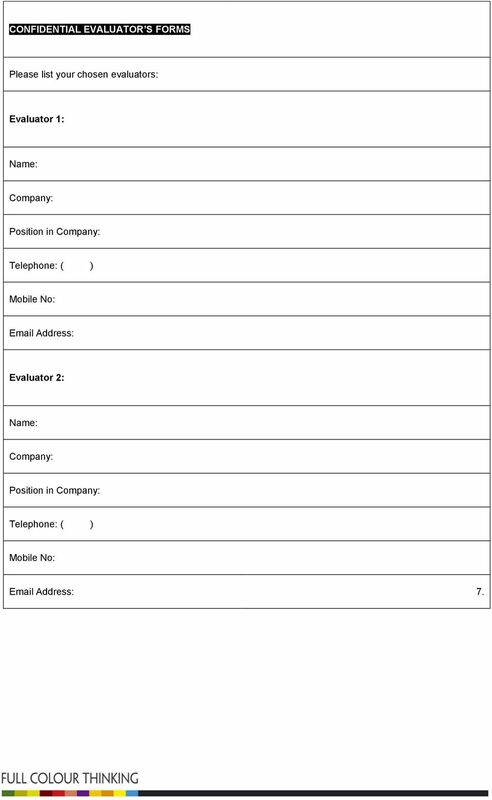 7 CONFIDENTIAL EVALUATOR S FORMS Please list your chosen evaluars: Evaluar 1: Name: Company: Position in Company: Telephone: ( ) Mobile No: Address: Evaluar 2: Name: Company: Position in Company: Telephone: ( ) Mobile No: Address: 7. 8 STATEMENT OF INTEGRITY I hereby certify that I have provided accurate information in this application. I authorise all persons or entities provide any relevant information in their possession the University of Cape Town or its agent for use in considering me for admission or verifying my credentials for admission, and I expressly waive any required notice me. I understand and agree that any misrepresentation or omission of facts in my application will justify the denial of admission, the cancellation of admission, or expulsion. This application is my own, honest statement the Admissions Committee. 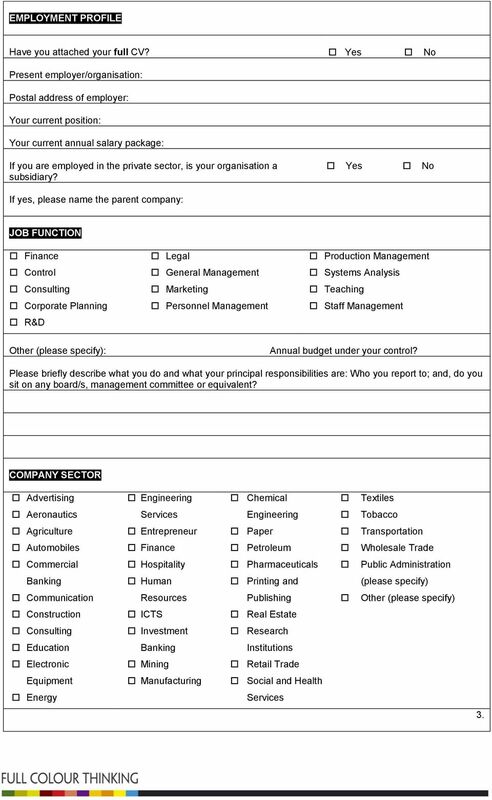 Signature: Date: CHECKLIST Before couriering your application pack, have you? 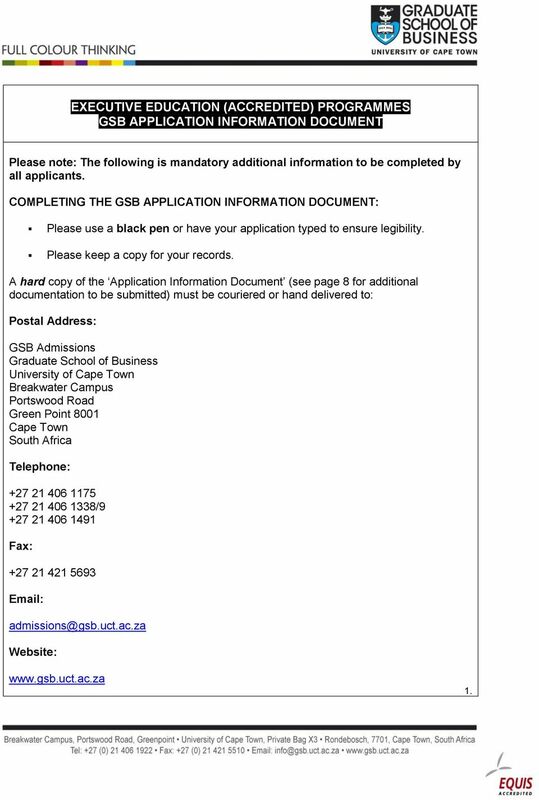 Fully completed UCT Online Application for Admissions in Completed and enclose the GSB Application Information Document. Enclosed a full CV. Enclosed a full academic record (certified copies). Enclosed 3 completed motivations. Enclosed proof of payment of Application Fee (See details below). Enclosed a copy of an Identity Document (certified copy). If a foreign student: Certified English translations of supporting documents. Certified copy of passport. Application Fee Payment Methods: 1. Direct deposit at any branch of Standard Bank. 2. Internet banking direct transfer. 3. Telegraphic or wire transfer (from outside South Africa). 4. Debit and credit card payments (we do not accept American Express or Diners Cards). 5. 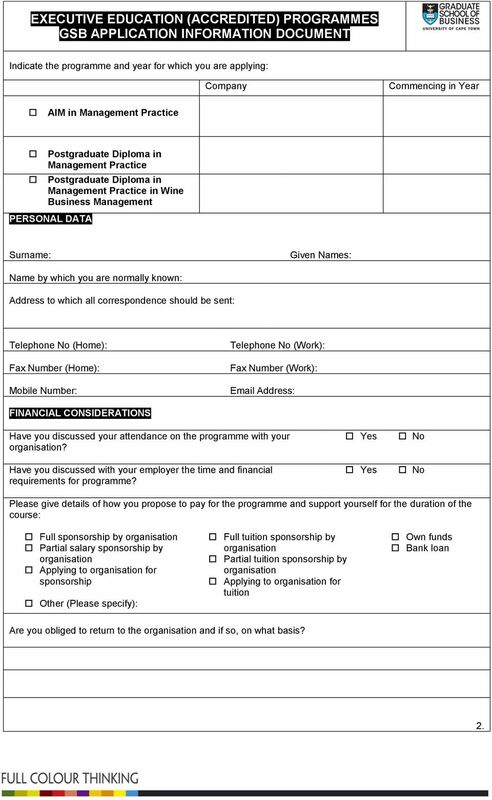 Cheque payments (cheques should be crossed and made payable the University of Cape Town and the student name and number must be written on the back of the cheque). 6. Cash payments up a maximum of R can be made at the GSB. Anything greater must be paid directly in a Standard Bank branch or via one of the options listed above. Banking Details: Beneficiary: University of Cape Town GSB Account No 9 Bank: Standard Bank SA Ltd Branch: Rondebosch, Western Cape Branch Code: Account No: Swift Code for international payments: SBZAZAJJ GSB Reference Number Format: GSB/ Surname/ First Name or UCT Student Number Postal Address: Admissions Graduate School of Business University of Cape Town Breakwater Campus Portswood Road Green Point Cape Town, 8001 South Africa 8. Return this completed form by post or in person. This form must not be faxed or emailed. Mimecast Graduate Program 2015 Application Form Graduates wishing to apply for the Office Management graduate program are invited to forward their CV and completed application form to graduates@mimecast.co.za. BURSARY APPLICATION 2. APPLICATIONS TO TERTIARY INSTITUTES ARE YOUR OWN RESPONSIBILITY AND WILL NOT BE DONE BY ANGLOGOLD ASHANTI. UEN: 199409389H Photograph Student Application Form (INTERNATIONAL STUDENTS) International DIRECT International LOCAL TRANSFER (including dependent pass holders) Request for exemptions with highest qualification? Deficiencies in English or in academic preparation will lengthen your period of study.